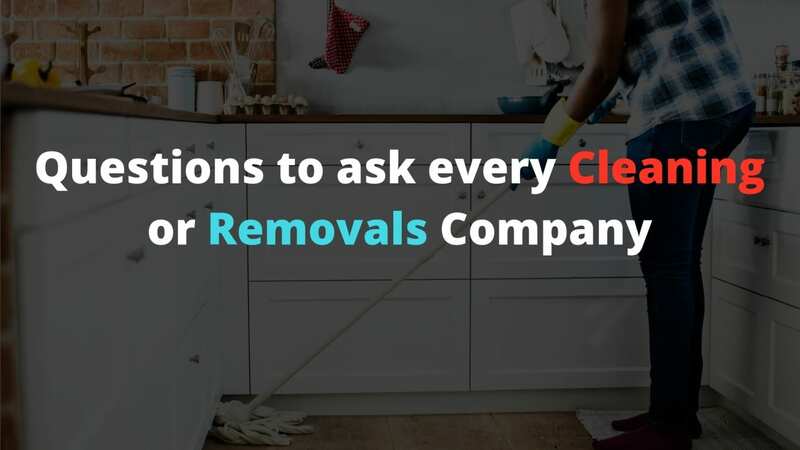 Our Friends at movevan.co.uk were kind enough to help answer some questions to ask every Cleaning or Removals Company. When it comes to home services like Cleaning services, Moving services and others, customers mostly make mistakes while choosing a company. The reason for this is that for all these industries like Removals services and Cleaning, the market is pretty much saturated. For example in particular to Cleaning services, there used to be professional cleaning companies for the Job. Now there are different types of cleaning agents/products too which help you get do most of the cleaning by yourself. This gives a large range of choices to the customers to choose from. And obviously all the companies try to show that they are the best for their respective service. So how do you know you have found the right company for your home service? The solution is simple. You need to test each of them, no matter if the company sells Removals, Cleaning or Man and with a Van service, you have to testify their professionalism. While hiring the company, talk to them over phone or face to face. You need to ask some specific set of questions. But these Questions are specific in a sense that their answers would be enough for you to decide whether you are going for the right home services firm or not. How have been Your Previous Clients Record? Being a customer you should always a good check on the previous clients’ record of the company you are hiring. As it’s one of the most important things to the customers. For example if you are talking about local house cleaning services, you may ask them to show you how many clients they have worked for, especially in your area. Knowing how the Cleaning or the Removals Company would’ve done, you would be able to make a good conclusion at the end. The reason for this is that the more clients they have worked for, shows the more they have been in business. And if you want to dive deeper you can contact their home services clients and ask them if they are satisfied with the respective company or not, and then make a decision. How does you do your work differently? “We are not your average cleaning company”, that’s the sentence almost all local cleaning companies quote. They claim that they are the only company which offers good level professional cleaning services. But the question is what actually makes them different? If it’s a moving company how they can be called professional movers and packers when they are pretty average and are known for nothing unique? And this doesn’t have to do anything with introducing new cleaning or moving machineries into the market. You don’t have to be innovatively great to stand out. But what it means is that you do have a solid reason for why the client should prefer you for all his business or house cleaning services over others companies. If a Company is offering Man and Van service it needs to highlight the benefits of Man and Van service that the consumer would get. Mostly the companies with special offers and packages are the one’s which offer their services the best. The reason is that they struggle hard to attain clients and this assures that they would deliver great service once they succeed at attaining them. Most of the time people try to do stuff on their own. For example for relocating they might hire a Van and do the Packing and Moving by themselves. But the big disadvantage here is that you aren’t trained to pack and move. So you choose the professional packers and movers for this job. So for example now you hired a Man and Van service, so that you could relax, but you see the staff messing around with the objects. The fact that they company don’t have their staff well trained is frustrating. Thus you should always ask the company how they exactly train their employees. No matter if it’s cleaning, removals, Man and Van or anything else, make sure that their staff is professional in their execution. Do you have the Required Equipment and Stuff? Try to uncover this aspect in detail. Get their whole plan of them unveiled in front of you. The reason for this is that you being their buyer should know how they execute. And the best way to start is to ask them what they have in equipment’s. And how all equipment would participate in getting the Job done. Let’s say you are hiring a Man and Van service in London, and then you should first of all ask them which type of Van the Job would require. Look if they have everything that’s needed to take the goal to the end level. The reason you should verify this part is that you are paying for a specific level of service. And you deserve what you paid for. Assume that through some cleaning brokers you hired a company for business cleaning services. And when they start cleaning, instead of using Vacuum cleaners, they are using traditional old timed sweepers. You would feel bad because commercial cleaning is different than residual cleaning. The same goes for all kind of services. You need to make sure whether the company is aiming to keep that level up or not. Do you have the Legal Documents? One of the most important things while hiring any kind of home services company is that they have the legal documents required. For example there are some specific licenses for a Moving Company to operate. And there are documents that you need to have before having your home servicing company. And they are a must to check for you. The reason is because you being a customer don’t want to be cheated on. Let me explain! The company might be telling you that they have a huge portfolio of clients and this and that. While in reality they might even not be registered legally. Or you could get trapped because of them. For example you might just hire a company that wasn’t allowed, for any specific reason, to operate. Moreover the company might be deceiving you from the point of faking their reputation. So there’s a ton of ways you could harm yourself by not verifying the documents properly. All the aspects we talked about above covers almost everything within itself. But make sure that when you ask each of these questions you ask them in as much depth as possible. You won’t need to ask anything other than these questions. And their answers would be enough for you to judge the credibility of the company you are hiring. Just keep in mind that some basic investigation is required no matter how reliable the company’s name is. So being a customer trusting a cleaning services app or hiring through just one Removals quote won’t be a good idea at all. Not even if you are just getting the windows cleaning service.